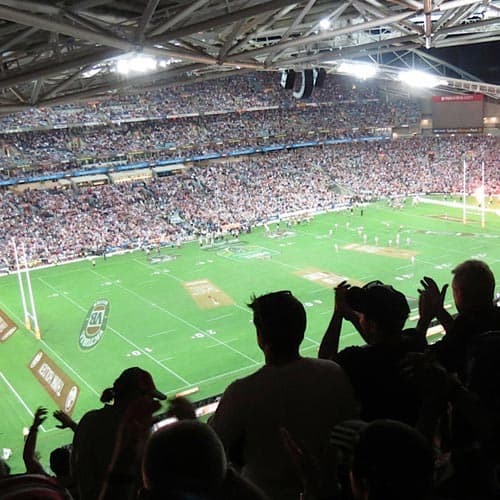 The NRL Telstra Premiership Grand Final Sydney is one the biggest events on the annual Australian sporting calendar and is also one the most highly attended club championships on the planet! The NRL Grand Final is something that must be experienced at least once by every League fan and sports fan alike! The biggest NRL game of the season (arguably aside from an Origin Game III decider! ), 80,000 diehard League fans take over Sydney’s ANZ Stadium to witness 80 historic minutes of hard-hitting action. Teams lay it all on the line in the ultimate game to stake their irrefutable claim as being the best in the land! Will your club be vying for the ultimate glory at ANZ Stadium in 2019?! However, the NRL Grand Final is much more than just the 80 minutes of the season finale, it’s also renowned for it’s fantastic pre-game entertainment. Past acts have included the likes of: Gang of Youths, Macklemore, Keith Urban, Richie Sambora, Cold Chisel, Slash, Train, Good Charlotte, The Script, Eskimo Joe and Kelly Clarkson. Not to mention there will be ‘curtain raiser’ matches before the pre-game entertainment and main event (in 2018, they were the NRL Holden Women’s Premiership Grand Final and the Intrust Super State Championship). Sportsnet’s inaugural and EXCLUSIVE NRL Legends Kick of Dinner on the Saturday night before the match. This exciting new event is a sit down dinner function with drinks served throughout the evening, special guest appearances from past and present NRL players, live music and entertainment and a celebrity MC. Sportsnet’s EXCLUSIVE NRL Grand Final One-Way Cruise Transfer to ANZ Stadium – the perfect way to start the day’s proceedings with a few drinks on the water, going under and past the iconic Sydney landmarks, Sydney Harbour Bridge and the Sydney Opera House en-route to the footy! General Admission entry into Royal Randwick Racecourse for Epsom Day. Please note that the below is based on last year’s schedule. 2019 schedule may differ in terms of both times and events.